The surface action potential can be thought of as a series of discrete electrical events occurring over time. Figure 27-32 schematically demonstrates cardiac events with the surface ECG. The P wave begins with spontaneous depolarization of the SA node with propagation throughout the right and left atrium. This is upright in the inferior leads as depolarization occurs from the topmost portion of the atrium and converges on the atrial septum at the AV node. The depolarization of and conduction through the AV node results in no surface activity, causing an isoelectric portion beginning at the end of the P wave and continuing to the onset of the QRS complex. The PR interval is the total time from SA node activation through the AV node until the beginning of ventricular depolarization. 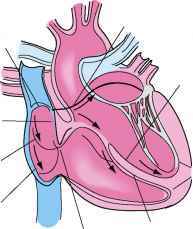 The His-Purkinje network is activated, rapidly depolarizing the large mass of ventricular myocardium. This results in the large QRS complex. The Q-T interval represents myocardial repolarization and may be prolonged in the setting of bundle branch block, drug effect, and genetic disorders causing abnormal ion channel function. Figure 27-32 Schematic diagram of the cardiac chambers and the associated surface electrocardiogram findings.